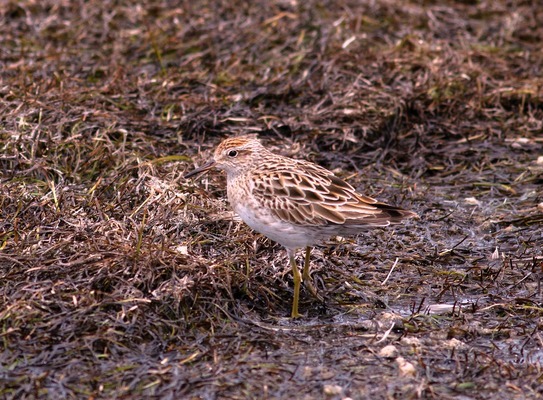 Latham''s snipe at Blue Waters Lake. I am about to leave for my yearly sojourn to Bermagui, which is on the coast of southern New South Wales, and I’m looking forward to building on my friendships with the resident white-bellied sea eagles and eastern whipbirds. Speaking of whipbirds, I noticed on Birdline Victoria that a whipbird was heard, but not seen, along Merri Creek in East Brunswick, which is very unusual. The only eastern whipbird I’ve heard this year was at Wilson’s Promontory, so I can’t wait to hear the distinctive sound again in Bermi. I had a lovely encounter with a female peregrine falcon on my way home from night shift one morning. I knew that it was a female bird because the female peregrine is noticeably larger than the male, and this one was a very impressive size, and a very beautiful creature. Peregrine falcons have a black hood, black upperparts with a white chin and throat. The chest plumage is finely barred from the breast to the tail. The eye-ring is yellow, and the heavy bill also yellow, tipped black. Peregrine falcons (especially the smaller males) are often mistaken for the Australian hobby, however the hobby lacks the full black head hood. The peregrine let me walk towards it slowly, and I was able to get quite close and have a bit of a chat before it flew off. It was a glorious start to the morning. While looking at the peregrine, I spotted European or common greenfinch, which I think was going to be the peregrine’s breakfast. 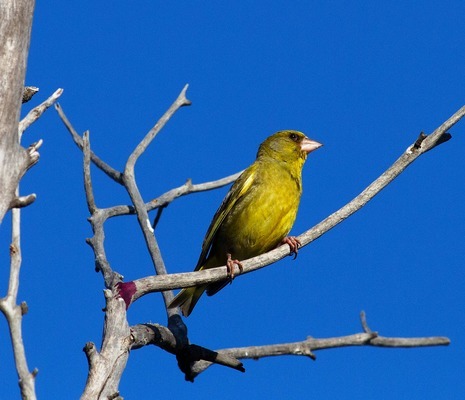 The European greenfinch is a primarily grey bird with olive-yellow underparts and face, and a bright yellow leading edge on its wing primaries. It has a thick, cone shaped, pale coloured bill. This pretty bird species was introduced to Australia from Europe in the 1860s along with the European goldfinch. I participated in the Latham’s snipe count in January. I like looking for snipe around Blue Waters Lake in Ocean Grove, as there’s always a few to see, plus many other species of birds. I noticed an Australasian grebe sitting on a nest quite close to the lake edge, so please keep dogs on their leads when walking around the lake. When looking for snipe I noticed a duck that was facing away from me (so I was looking at its backside) with bright orange legs, and had forgotten that Australasian shovelers have very orange webbed feet and legs. I stared for ages at the bird until I saw its beak, and then I computed what the bird was as the beaks of the shovelers are distinctive, large and square shaped (they are also known as a spoonbill duck). Then I noticed a female shoveler with the male. 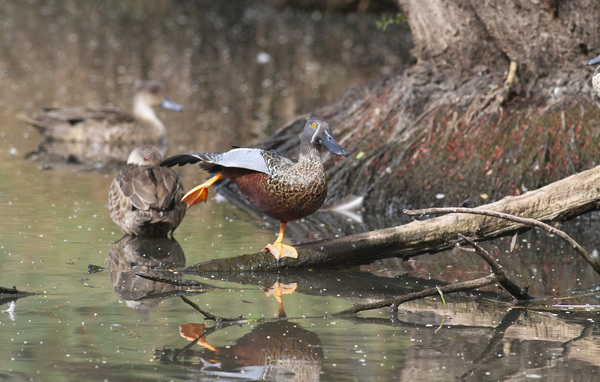 The male in breeding plumage has a grey-blue head with a white crescent between the yellow eye and the bill. The back and rump are black, and the shoulder and wings coverts are blue. The male shoveler is a very striking looking bird. Females are chestnut coloured with much duller plumage. After chatting to the shoveler for a while I went back to my original purpose, which was to look for Latham’s snipe and sure enough I spotted only one bird that was hiding in the grass. Latham’s snipe breed in Japan and on the east Asian mainland and are a nonbreeding migrant to the south east of Australia including Tasmania. 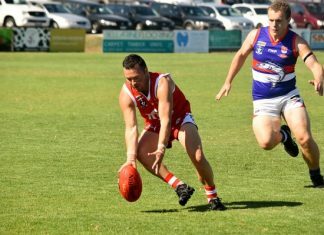 It is a tribute to Ocean Grove residents keeping their dogs on leads and under control that a snipe can be seen in such a busy place as Blue Waters Lake, in the middle of summer, so thanks to all. I’ve been keeping my eye on a spoonbill tree somewhere in the Bellarine, where there have been several nests. On my way home from night shift there are often 20 to 30 royal spoonbills perched on the top of the tree which is a magnificent sight. They must disperse to feed because in the middle of the day there are only a handful of birds around, with the odd yellow-billed spoonbill around. 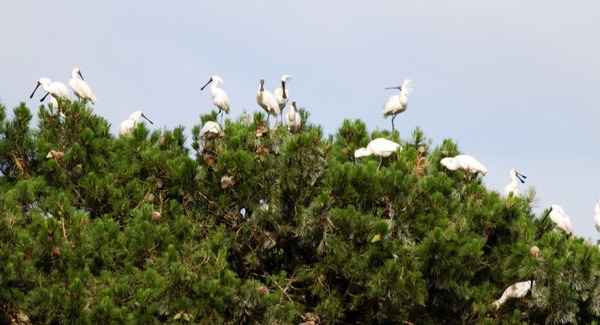 A tree full of spoonbills is prettier than a tree full of flowers for sure. I was passing Swan Bay jetty one day and had to go down to see what was around. Even though it’s busy this time of year with many fishing boats being launched from the boat ramp, there were still some sharp-tailed sandpipers in the shallows, and it’s amazing to see how well they blend in and camouflage with the sea grasses on the shoreline. I also spotted a around eight Caspian terns, including three young birds, which was great to see. In regards to hooded plovers around the Bellarine, there’s someone in Point Lonsdale who likes to interfere with the signs on the beach, which causes much havoc. DELWP don’t want to know about this person unless they directly interfere with the nests or eggs or birds, even though there’s been photos taken showing the culprit destroying signs. On a brighter note there is least one hoodie chick near 4W, and a nest near Point Lonsdale SLSC. There are also three chicks at Turtle Rock. The chick that fledged at Fairhaven recently was spotted at Collendina during the week. Sandy Goddard took some amazing photos (and sad pics) of a nankeen kestrel taking a freshly hatched hooded plover chick on 13th Beach just west of the Bluff, which more or less solves the mystery of all this pair’s chicks disappearing over the years. Some hooded plover volunteers witnessed a black labarador kill a hooded plover chick at Point Roadnight last week. The dog was off lead despite the signs and the owner and dog just walked off into the sunset. Life’s tough for these little hoodies for sure.